Protect the pipes in your home with Canarsee's selection of self-sealing foam pipe insulation. This item guards the pipe from accidental bumps and offers thermal insulation. They also dispense the sealing step because they come equipped with self-sealing technology. Find foam pipe insulation for copper, PEX, CPVC, brass, steel and iron tubing in various diameters. The 6IE038058 from Nomaco is a 5/8” ID x 3/8” Wall, Semi-Slit Pipe Insulation, 6ft. It's a closed-ce.. The 6IE038078 from Nomaco is a 7/8” ID x 3/8” Wall, Semi-Slit Pipe Insulation, 6ft. It's a closed-ce.. The 6IL038058 from Nomaco is a 5/8” ID x 3/8” Wall, Self-Sealing Pipe Insulation, 6ft. It's a self-s.. The 6IL038078 from Nomaco is a 7/8” ID x 3/8” Wall, Self-Sealing Pipe Insulation, 6ft. It's a self-s.. 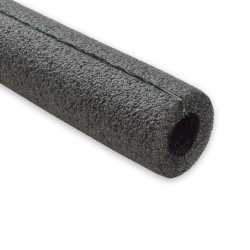 The 6IE038118 from Nomaco is a 1-1/8” ID x 3/8” Wall, Semi-Slit Pipe Insulation, 6ft. It's a closed-.. The 6IL038118 from Nomaco is a 1-1/8” ID x 3/8” Wall, Self-Sealing Pipe Insulation, 6ft. It's a self.. The 6IE048078 from Nomaco is a 7/8” ID x 1/2” Wall, Semi-Slit Pipe Insulation, 6ft. It's a closed-ce.. The 6IL048058 from Nomaco is a 5/8” x 1/2” Wall, Self-Sealing Pipe Insulation, 6ft. It's a self-seal.. The 800-TAPE-PB from Nomaco is a Poly Tape for Insulation, 2” wide x 36 yards, Indoor/Outdoor. It's .. The 6IL048118 from Nomaco is a 1-1/8” x 1/2” Wall, Self-Sealing Pipe Insulation, 6ft. It's a self-se.. The 6IL048138 from Nomaco is a 1-3/8” x 1/2” Wall, Self-Sealing Pipe Insulation, 6ft. It's a self-se.. The 7PXE100058 from Nomaco is a 5/8” ID x 1” Wall, Semi-Slit Pipe Insulation, 6ft. It's a closed-cel.. The 6IL100058 from Nomaco is a 5/8” x 1” Wall, Self-Sealing Pipe Insulation, 6ft. It's a self-seal t.. The 6IE100078 from Nomaco is a 7/8” x 1” Wall, Semi-Slit Pipe Insulation, 6ft. It's a closed-cell po.. The 6IL100118 from Nomaco is a 1-1/8” x 1” Wall, Self-Sealing Pipe Insulation, 6ft. It's a self-seal.. The 6IL048078 from Nomaco is a 7/8” x 1/2” Wall, Self-Sealing Pipe Insulation, 6ft. It's a self-seal.. The 6IL048158 from Nomaco is a 1-5/8” x 1/2” Wall, Self-Sealing Pipe Insulation, 6ft. It's a self-se.. The 6IL048218 from Nomaco is a 2-1/8” x 1/2” Wall, Self-Sealing Pipe Insulation, 6ft. It's a self-se.. The 6IL100078 from Nomaco is a 7/8” x 1” Wall, Self-Sealing Pipe Insulation, 6ft. It's a self-seal t..